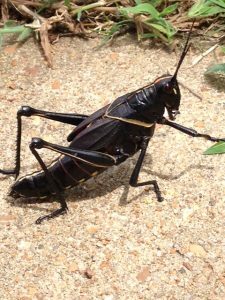 The Lubber Grasshopper is a common resident of the Field Station during the late summer and early fall. 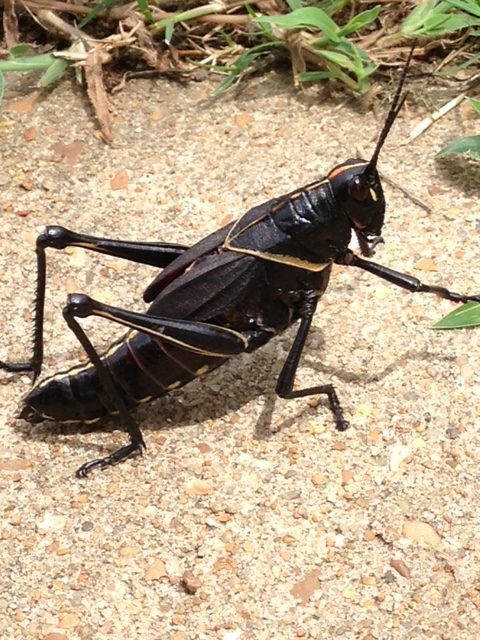 Its large size (76 mm or about 3 inches), distinctive black coloration with bright red, orange or yellow stripes and short wings make them easily differentiated from other grasshoppers. Flightless and weak jumpers; these insects tend to walk rather hop. Their common name lubber is likely derived from an old English word “lobre” which means lazy or clumsy. Poor mobility and bright colors would seem to put the lubber grasshopper at risk of predation however the toxic plant material this grasshopper feed on imparts a foul and toxic flavor that most predators try to avoid. One of the few animals reported to eat lubbers is the loggerhead shrike, which eat the grasshopper after having impaled it upon a thorn for a few days.